Currently, there are two Curacao All-Inclusive Resorts: Sunscape and Renaissance. Here is our review of these properties on the sunny island of Curacao. 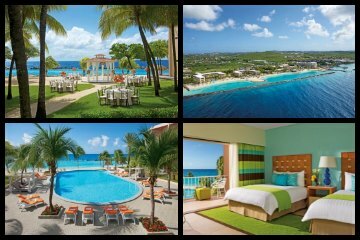 Sunscape Curacao Resort Spa and Casino is a low rise family-friendly complex that is situated on the southwestern portion of the coastline just two-miles from Willemstad. This Curacao all-inclusive resort has a nice section of man-made beach that is protected by a rock jetty and offers good swimming. The property has over 300 rooms and suites for guests that are modern and spacious with views of the resort, gardens, pools and Caribbean Sea. Patrons have the option to upgrade to Sun Club rooms and suites which offer additional amenities. Non-motorized watersport equipment is complimentary and there are additional beach activities to keep you occupied during the day. The resort has six distinct restaurants that serve breakfast, lunch and dinner buffet-style as well as with ala carte menu service. Restaurants are on a first come first serve system and wait times can be lengthy during high season. The complex has three freshwater swimming pools with one having a swim-up bar. Nightlife includes live music, themed dinners and an occasional dance group. Options for nightlife and dining are just moments away in Willemstad or along the coastline. The property has a nice fitness center, dive center, full service spa and a climbing wall for guests. The Arawak Camp is perfect for families looking for a Kids Club with organized activities for their children. Rooms: This Contemporary-style décor low rise Curacao all-inclusive resort offers 341 upper mid-range rooms and suites. There are four styles of rooms that are 328 square feet in size with garden, ocean as well as oceanfront views and a private balcony. Upgraded Sun Club accommodations include Sun Club Ocean view rooms with a private balcony, junior suites at 420 square feet with a kitchenette, the Sun Club Master suite is a large 1,020 square feet with a huge balcony, kitchenette and perfect oceanfront views. Presidential suite is oceanfront with 784 square feet of living space. Restaurants: The Sunscape Curacao all-inclusive resort has six restaurants onsite serving a variety of international and regional cuisine. Coco Café is open 23-hours a day with light fare and quick snacks; World Café serves eclectic buffet-style cuisine for breakfast, lunch and dinner; The Bluewater Grill serves lunch and dinner with ala carte service that includes Caribbean-style cuisine; Da Mario has an adults-only area inside and an outside terrace for families with ala carte Italian menu; Himitsu serves dinner and boasts exciting Pan-Asian dishes; Oceana Seafood Restaurant has a gorgeous outside setting with an ala carte menu that features excellent. The resort has three cocktail bars which serve signature island cocktails. Beach: This is a man-made beach which stretches for almost a mile. There are a few palm trees and plenty of space for umbrellas. Beach Activities: Sunscape Curacao all-inclusive resortoffers complimentary non-motorized watersport equipment such as standup paddleboards, kayaks and more. Other activities include team games, dance lessons and exercise classes hosted by the entertainment staff. This location is protected by rock jetty which allows for good swimming. Entertainment: This property offers nightly shows that range from live music to acrobats to choreographed dancers. The resort has three bars and a casino. The complex has an entertainment staff dedicated to keeping the action full of fun from morning till night. There is also a rock climbing wall and a lawn area for horse shoes, bocce ball as well as bean bag toss. There are two lighted tennis courts, fitness center, dive center and spa onsite. Shopping and nightlife options exist in nearby Willemstad. Kids Activities: Sunscape Curacao all-inclusive resort has The Explorer’s Club For Kids is available to children 3 to 12 years of age. This kids club has organized activities such as games, movie nights, arts and crafts. This kids club has programs on exploration, nature and science. The resort has a playground and a separate children’s pool. The Core Zone Teens Club has great activities like karaoke and movie night for children 13 to 17 years of age. Attractions: Casino, Rock Climbing Wall, Tennis Courts, Fitness Center, Dive Shop and Spa onsite; Scuba Diving; Motorized and Non-motorized Watersports; Fort Amsterdam; Kura Hulanda Museum; Riffort Village; Queen Juliana Bridge; Christoffel National Park; Ostrich Farm; Hato Cave; Blue Bay Golf Course; Dolphin Academy; Old Quarry Golf Course; Curacao Sea Aquarium. Pools: Sunscape Curacao all-inclusive resort has four freshwater swimming pools which include an activities pool dedicated to water aerobics, volleyball and other watersports. The main pool is equipped with a swim-up bar. The complex has a quiet pool and an adults-only Jacuzzi. There is a separate children’s pool onsite. Renaissance Curacao Resort and Casino is an upper-range property that is family-friendly. The Curacao all-inclusive resort is situated around historic Rif Fort which is located at the mouth of St. Anna Bay on the southwestern coastline near Willemstad. The beach area is nice with lots of space for shade and white sand that offers calm waters for swimming. The low rise complex has a variety of rooms and only rooms with a view of the ocean or interior have balconies or patios. One-bedroom suites have an extra half bathroom and large balconies or patios with views of the ocean and the island. The beach area offers a plethora of motorized and non-motorized watersports equipment available from local vendors. The Infinity Beach Club Bar and Grill has everything you need for food and drinks while lounging. The resort has five restaurants onsite that vary in cuisine and service styles like buffet or ala carte. Xquisit has a nice three-course dinner menu for a responsible price. The Blue Lobby Bar has island cocktails and live music on selected nights. Located within an easy distance to Willemstad there are plenty of opportunities for nightlife and additional dining options. The Infinity freshwater swimming pool has a nice deck with a view of the Caribbean Sea. There is a full service casino, fitness center and spa onsite to occupy guests. There is no formal kids club at this property but there is a nice children’s pool with a play area. This resort does have babysitting services available for an charge. Rooms: Renaissance Curacao all-inclusive resort is composed of low rise buildings that feature rooms with no view to a view of the ocean. Interior rooms do not have a view or a balcony. Resort view rooms are similar in size and do not have a balcony. Island and Ocean view rooms have a nice 50 square feet private balcony or patio. There are three styles of suites that include the one-bedroom Executive has a resort view with one and one-half bathrooms, private balcony as well as a whirlpool. Imperial and Majestic suites are similar except for the view and have a separate dining room as well as a larger living area. Restaurants: This complex has five restaurants that serve exciting and innovative cuisine. Starbucks has light fare and fresh coffee drinks. The Nautilus Restaurant features buffet-style and a nice ala carte menu for breakfast, lunch and dinner; Xquisit has a three-course price fixed menu at lunch and dinner with an excellent ala carte menu with grilled steaks as well as seafood; Infinity Beach Bar and Grill has exciting menus for lunch as well as dinner with specialties like pan-fried lion fish. The Blue Lobby Bar has innovative snacks and signature island cocktails. Off-property options within a close distance include Bistro Le Clochard for French cuisine or Emma-Tei for eclectic Japanese dishes. Beach: The beach area at Renaissance Curacao all-inclusive resort is fabulous with white sand and plenty of palm trees. The wide stretch is perfect for lounging under a cabana or enjoying the Infinity Beach Club. Beach Activities: There are plenty of activities on this wide stretch of white sand. The Infinity Beach Club Bar and Grill is ideal for guests lounging on the beach. Motorized and non-motorized watersport equipment is available for rent by local vendors. The water is calm and swimming is good at this resort. Entertainment: There is a casino, fitness center, the Renaissance Shopping Mall and spa onsite. The complex has live music on selected nights of the week for guests and there is a beach club. There is plenty of nightlife just moments away in Willemstad at locations like Sopranos Sports Bar and Pizzeria as well as Club Zen/k-Oz Bar for an adventurous night of dancing. Kids Activities: Renaissance Curacao all-inclusive resort does not have an organized kids club for children. There is a small Infinity pool for kids and babysitting services are available for an additional charge. Attractions: Casino, Fitness Center, Dive Shop and Spa onsite; Scuba Diving; Motorized and Non-motorized Watersports; Fort Amsterdam; Kura Hulanda Museum; Riffort Village; Queen Juliana Bridge; Christoffel National Park; Ostrich Farm; Hato Cave; Blue Bay Golf Course; Dolphin Academy; Old Quarry Golf Course; Curacao Sea Aquarium. Pools: Renaissance Curacao all-inclusive resort has a beautiful Infinity freshwater swimming pool for guests. There is also a small Infinity pool for children.